It’s quite a strange experience being a Vietnamese-American back in Vietnam for the first time. I was not expecting to have to deal with such complex identity issues. Just merely walking down the street, it is blatantly obvious that I am not a local or a native but I get the impression that I am not viewed in the same light as other Westerners here. It is as if I am held up to a different standard. I am expected to conform to Vietnamese culture and standards although it is quite apparent that I am a foreigner. So what am I? Vietnamese? Westerner? I am a viet-kieu. One who’s parents are of Vietnamese origin and is now returning back to the country. It’s a connection and an identity I have yet to explore and understand but there is still quite a bit of time left for me to figure it out. VA NGO is a network of numerous Vietnamese-American NGOs dedicated to development in Vietnam. What it really is, is an amazing network of women who have banded together all with similar goals, passions and ideals of helping people. They share their resources and expertise amongst each other and their organizations. It is very grassroots and very beautiful. As for the VA NGO workshops, topics that were covered included nutrition, arts and crafts, women’s well-being, early childhood to adolescent development, and basic first-aid. These conferences sought to empower women with knowledge and novel approaches to what they do on a daily basis in and outside of their profession, child development. The workshops were amazingly progressive yet also surprisingly, culturally sensitive. It was far from the typical, problematic situation of westerners coming in and imposing knowledge on people in a developing country but rather quite the opposite. It was a collaboration of Vietnamese and Vietnamese-American women coming together in a beautiful exchange of information to produce a powerful product, one that has the potential for great change. Being involved in education is bittersweet because ideally it targets the root of many problems but its results and affects are sometimes difficult to measure. Regardless, this past week has given me much hope. Today was a big day at the Thriive office! We held the first information session for potential applicants to discuss about Thriive and the application process. Rachael and I are both working on the Thriive project. We just opened up applications for Thriive for 2011! Thriive is a unique Equipment Capital Loan program to benefit small growing businesses. In brief, ThriiveCapital Loans are loans that are delivered in the form of equipment (not money) to businesses. The businesses pay back the Loan in the form of either donating goods/services that the business produces, or providing vocational education training to those in need (referred to as the “Charitable Paybacks”). Further information about Thriive is set out below. We had a great turn out to the information session and were thrilled to have such a diverse range of applicants in attendance – from bakeries to construction companies to farmers. It was great to see our marketing efforts paying off – some business owners had learned about Thriive through TV, others through the radio and the newspaper. It was not too long ago that the Hue Thriive Team were drafting the content of the marketing efforts and determining our marketing strategy! An amazing thing happened in the information session today– in explaining the Charitable Paybacks, we mentioned how we had visited a school that had needed chairs for its students, but were unable to afford to purchase such chairs – such schools form the group of Recipients of the Charitable Paybacks. At the end of the information session, two businesses owners approached our team and said that they would like to donate money to the school, so that the school would finally have chairs it needs for its students. 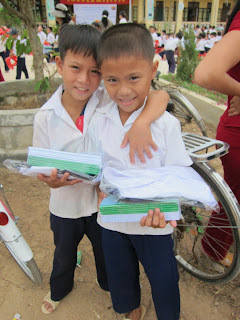 It’s really heart-warming to see the spirit of giving alive in Hue City, and to realize that we helped to make a connection between the school and businesses. In particular, it felt rewarding to see that we helped to make an impact on the school’s situation. Community empowerment and charitable giving/philanthropy are the ultimate goals of the Thriive program! Everyday, we have applicants coming to our office to ask about Thriive, which is really motivating for us. Hopefully, by the time that the Applications close (22 August 2011), we will have a great and diverse candidate pool from which to choose the Thriive Businesses of 2011! P. S. More information on Thriive is set out below. FHF and Thriive Organization has partnered to launch the second year of Thriive in 2011. Thriive was first launched in Hue City, Vietnam in August 2010. Thriive aims to support small and growing businesses by offering interest-free equipments based loans that are to be paid back with charitable repayments to the community up to the value of the ThriiveCapital Loan. - Provide a meaningful charity payback to the community. - Products – i.e., a tailor that obtains a new sewing machine valued at 2,000,000 VND repays the ThriiveCapital Loan in uniforms valued at 2,000,000 VND that are to be donated to the disadvantaged students of a local school. - Services – i.e., a dentist obtains a high-tech dental chair and x-ray equipment, he/she then repays the ThriiveCapital Loan with free dental exams and dental work to underprivileged women and children. - Job/vocational training – i.e., the owner of a tailoring business receives a new sewing machine and repays the ThriiveCapital Loan by providing vocational training on sewing skills for local youth and unemployed individuals with the potential to offer jobs to these individuals upon completion of the training. We use the retail value of the charitable goods, services and/or vocational training in order to calculate the repayments of the ThriiveCapital Loans. On Friday, the kids from the Children’s Shelter, FHF staff and volunteers embarked on a day excursion to Ba Na Mountains. It was my first ‘school’ excursion in a long time, so I was pretty excited! We assembled onto the bus and took off from the Children’s Shelter at 6.30am, and drove for a couple of hours, past Da Nang before reaching Ba Na Mountains. Ba Na Mountains is located in the Truong Son mountain range 25 km to the SW of Da Nang at an altitude of 1487m. Upon arrival to Ba Na, we did a quick head count, formed two straight lines and marched into the tourist area. The main attraction there is the cable car ride up to the top of the mountain, which we rode for 15 minutes, with views of the lush green jungle and waterfalls along the way. Reaching the top of the mountain, it was refreshing to have a much cooler climate than we did at the foothills. The House Mothers of the Children’s Shelter had packed a delicious lunch of xoi (sticky rice) and braised chicken all wrapped in banana leaf, which the children and staff enjoyed over a picnic under some shady trees. With our bellies full, and with the much cooler climate, all the children and staff happily explored the area and hiked a few flights of stairs to Linh Ung Pagoda, which is symbolized by a 27m tall Buddha. The children really enjoyed themselves. It was nice to hear squeals of delight and excitement, and to see lots of running around in awe. Ah, child-like wonder! With the children sufficiently tired, we packed them all into the bus and they napped for most of the ride back home. Playing is tiring business! All in all, a nice day out for some sight seeing and great time spent playing with the children. During my corporate lawyer days in Sydney, my morning take-away coffee used to a double shot espresso soy extra hot latte. 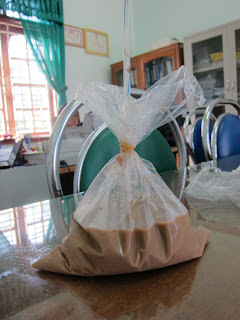 Now, it’s coffee in a plastic bag and straw attached with a rubber band. Simplicity at its best. Just as delicious. On 16th July 2011, we had the Grand Opening of Café Môtê. The café is owned by the Friends of Hue Foundation (FHF) and all proceeds go towards the Children’s Shelter operated by FHF. The café is a lovelyand relaxed space. The café features menus and art pieces that have been beautifully designed by the children of the Children’s Shelter. There are also quaint and vintage pieces of furniture (some painted/restored by the children) and decorations artfully placed throughout the café. The menu items are delicious. The café’s speciality drink is banana and coconut soy milk fruit smoothie. Personally, I loved the ice coffee and mango lemon fruit smoothie and devoured every last drop of these refreshing drinks. From 16th July – 22nd July 2011, all drinks are 20% off the normal prices. All the more reason to eat out for a great cause! Congratulations to the FHF team for their hard work, dedication and successful Grand Opening! 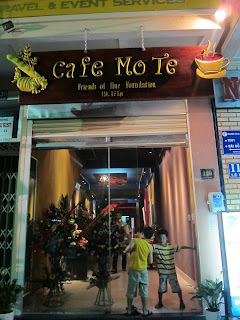 Café Môtê: 120 Le Loi Street, Hue City, Vietnam. More information on FHF: http://www.friendsofhue.org/. I reach Hue City, Vietnam in the morning of 27th June, one day before the start of my fellowship. Following multiple flight transfers and airport transits, it’s surreal to think that I’m actually here - after months of dreaming of working in Vietnam, researching fellowship opportunities and preparing for the trip. Walking off the plane in Hue Airport and into the terminal, I’m immediately struck by the heat and humidity. It’s hot. Really, really hot, and it’s not hard to immediately sweat from the sweltering and seemingly suffocating heat. Driving into the City, the streets are packed with “xic lo” and scooters zooming at dizzying speeds in every direction. I guess there’s an order to this madness, but for the uninitiated, I quietly wonder why there aren’t massive car pile-ups at every street corner. 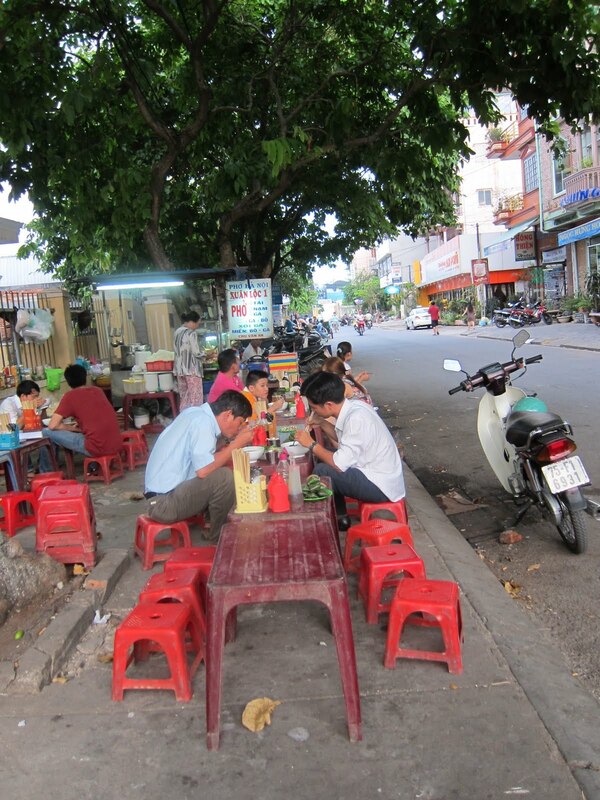 The streets of Hue are a feast for the senses. Every passing minute in the City promises smells ranging from sweat and dirt, to delicious steaming bowls of noodles wafting from nearby street vendors, and fresh produce and fruit from the street markets. The horns of scooters and cars blare in quick succession narrowly avoiding one another, the sounds of machinery operating continues throughout the day on the numerous construction sites around the City, and xi loc and “xe om” drivers shrewdly persuade and heatedly negotiate fares with pedestrians. Visually, Hue City contrasts with the bigger cities of Ho Chi Minh City (HCMC) and Hanoi. To me, being in HCMC felt like I could have been in any other city in Asia, but Hue’s brown dusty dirt roads, ubiquitous street vendors, family-operated outdoor eateries lined with small plastic chairs and tables, and the absence of towering buildings and billboards gives Hue a quaint charm. After checking into my hotel, I make my way to the Friends of Hue Foundation (FHF) office to meet the FHF staff which includes Chi Nhi (FHF In-country Director), Linh (Volunteer and Thriive Coordinator) and Van Anh (Volunteer, HIPE and MCP Project Coordinator). I’m also glad to meet the other Vietnamese American Scholarship Foundation (VASA) Cultural Bridges Fellows: Rachael and Nathalie (their bios can be found here) both of whom are working on the various programs that are operated by FHF in Hue. In addition, we have Lisa Vu, from Tennessee, U.S.A. Lisa is a Summer Volunteer who will be focusing on the HIPE (Health Initiative for Peer Learning). In particular, Lisa will be focusing on how FHF has operationalized HIPE. Lisa will work on developing a new curriculum for HIPE and will conduct key informant interviews to understand the new track for curriculum development. As a VASF Cultural Bridges Fellow, I will be focusing on FHF’s Thriive program over the next 9 weeks. The Thriive program is a unique Equipment Capital Loan program to benefit small growing businesses. I will aim to help develop the protocols and procedures of Thriive and FHF with a view to: strengthening the short-term and long-term evaluation frameworks for Hue-Thriive Businesses (recipients of the Thriive Equipment Capital Loan); and to promote the long-term growth of the Hue-Thriive Businesses via the establishment of a Hue-Thriive Business Association. Throughout my Fellowship, I will blog my adventures in Hue ranging from the work of the fellowship to my culinary discoveries in Hue, along with other insights and observations during my time in Vietnam. I’m thrilled to be here and can’t wait to hit the ground running and to get to know the FHF staff, volunteers, Thriive program, and Hue City better. Being in Vietnam has been quite surreal. On the one hand some things seem so familiar, bun bo Hue, banh loc and banh beo are all staples of my childhood and Hue origins. While other things are bizarre and unfamiliar such as the stark contrast between rich and poor, the under-served and privileged. The difference that I’ve noticed in Vietnam, unlike in more Western countries, is that the rich and poor are not isolated in separate enclaves but rather they intermingle amongst each other throughout the city. The suburbs are nonexistent; five story mansions stand erect next to tin shacks. The disparities are much more visible here than in the US. However, the lack of Western influences allows for a level of purity in Hue that is quite refreshing. This particular region has less western influences than bigger metropolises such as Saigon, Ha Noi or Da Nang and thus, there is a level of pristine-ness to the area that I think is special to my experience. Being less distracted by modern technology allows me to connect more with the people and environment around me, such as meeting with friends for cafe sua da or che on the sidewalk. It is the simplicity of things that I find beautiful.